This is a step-by-step tutorial designed to help you create a sales funnel using WordPress, the Contact Form 7 plugin, and the Contact Form 7 MailChimp Extension plugin. Both plugins are free and will not require additional PHP programming. You will need to have a MailChimp account and an active MailChimp list to proceed. This article assumes that you have already installed WordPress and Contact Form 7 and that you have a basic understanding of how to use both. The7 theme was used to create the sales funnel in this tutorial. Recently a client hired me to create a sales funnel using WordPress. The sales funnel needed to run independently of the client’s established business website, as well as be set up on a sub-domain. I needed a solution that was cost-effective (free) and that would connect to the MailChimp API to use its autoresponders. There are several free WordPress plugins that create a form that connects to MailChimp, but unfortunately, some of these plugins are only usable as a widget. And using a widget was not an option for this application. Also, a form that would integrate into the theme seamlessly was ideal, as I didn’t want to spend time rewriting CSS to match the website’s design. The Contact Form 7 plugin was a great solution because many themes support it, including The7 theme that my client had already purchased. Just using Contact Form 7 was not a final solution, though, as I still needed a way to connect to MailChimp. Fortunately, I found a free little gem called Contact Form 7 MailChimp Extension. 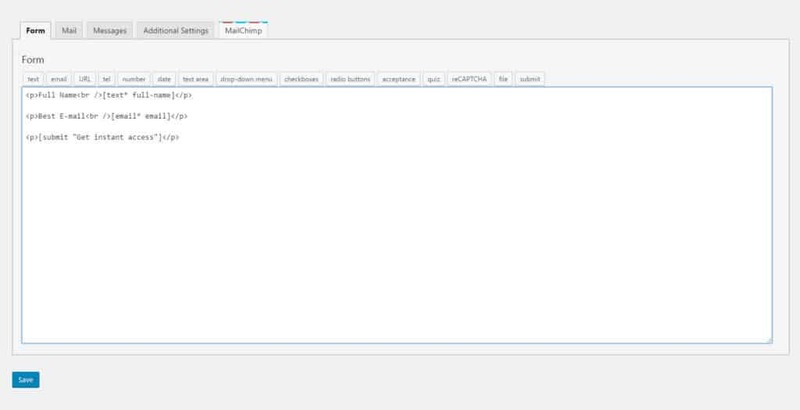 This tutorial will show you how to set up this plugin. Contact Form 7, by itself, is not capable of connecting to the MailChimp API. 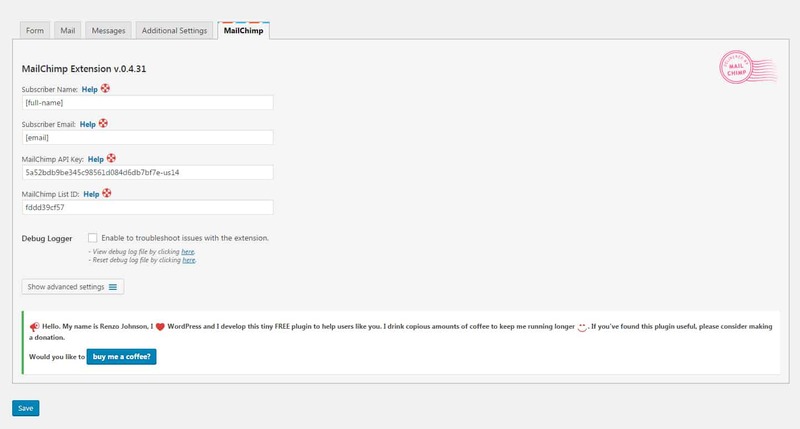 You will need to install the Contact Form 7 MailChimp Extension plugin. You will also need the Mailchimp API key and List ID from your MailChimp account. 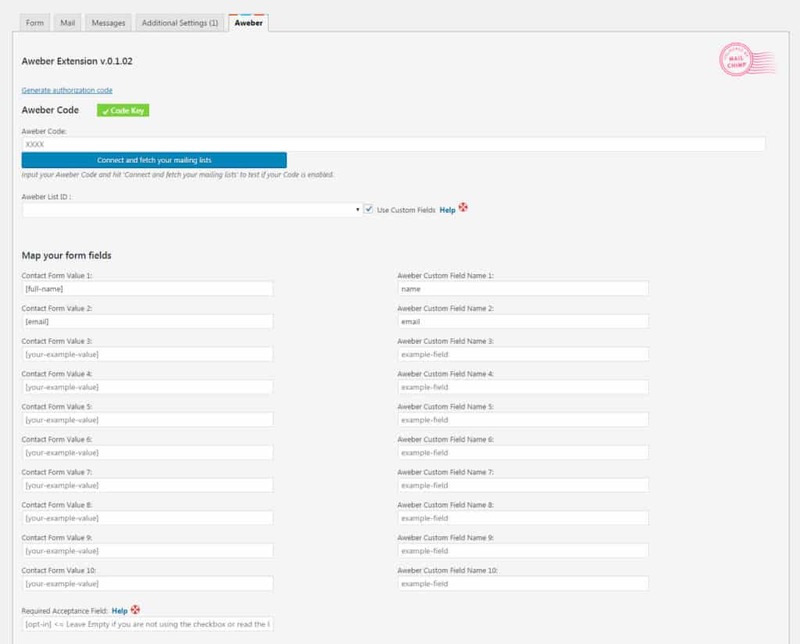 You will find the List ID in red towards the top right of the page. and edit the form you want to use in your sales funnel. Make sure to include the Name and Email tags in your form. NOTE: It is not necessary to set up the options on the “Mail” tab unless you want an email notification sent to you when the form is submitted. The newest version of Contact Form 7 has deprecated the on_sent_ok as of version 5.0. The easiest way to implement the redirect after submit feature is to use the Contact Form 7 Redirection plugin. Install the plugin and configure it appropriately. In Steps 2 & 3 you located the MailChimp API key and List ID. 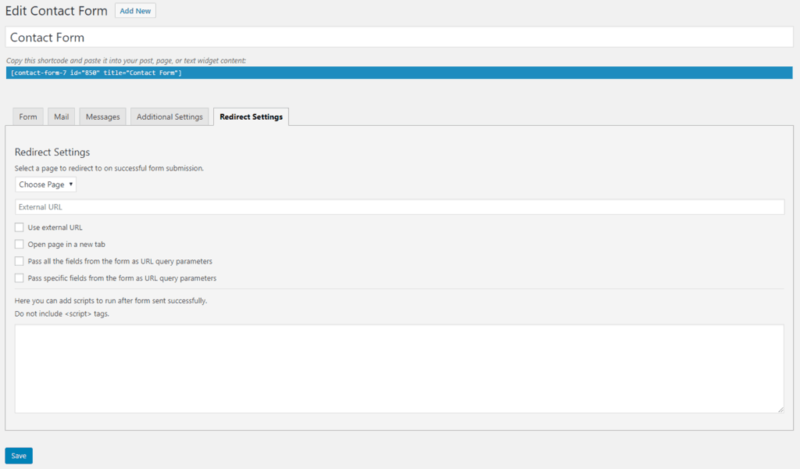 You will need to put both into the Contact Form 7 MailChimp Extension plugin settings. Click on the MailChimp tab. This is where you will add the API key and List ID. You will also want to include the Name and Email tags from your contact form. 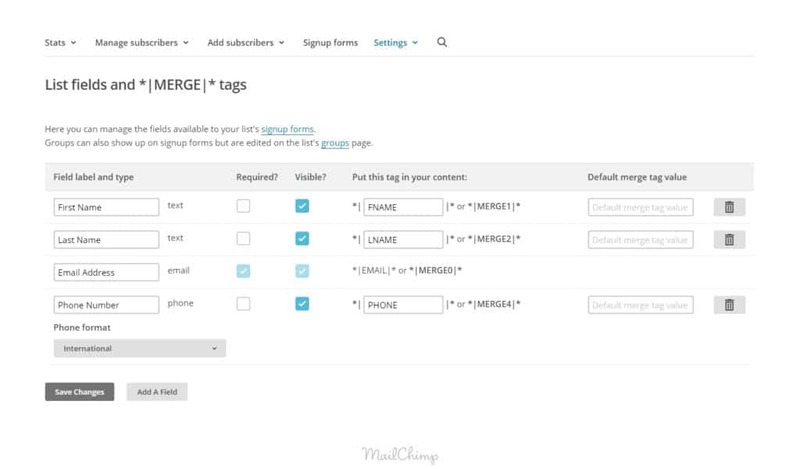 If you’ve created a contact form that has fields other than Name and Email, you can match the tags with the Custom Field Name you have created on the MailChimp website. Otherwise, skip this step. 1. First, click on the Show “Advanced Settings” button. 2. Second, check the “Custom Fields” option box. 3. 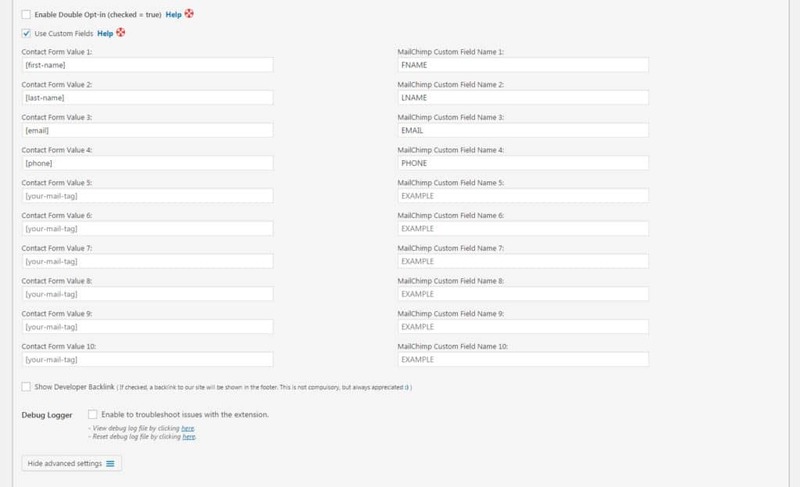 Third, add the tags to the Contact Form Value fields and match each one with the corresponding MailChimp Custom Field Name. NOTE: When you use a Full Name field in your contact form, the tag is sent to MailChimp through the API, it is automatically separated into a First Name and Last Name, and then added to your list. But, if you create a contact form with the First Name and Last Name fields, you will need to use the Advanced Settings example above. NOTE: If you are using a theme with Visual Composer installed, add the Contact Form 7 element to the page and choose your form from the drop-down. You may want to install the Contact Form DB plugin to save the submitted form information to your WordPress database. This can be used as a backup to MailChimp, especially if something breaks and MailChimp doesn’t receive the form submission. If you are going to use AWeber instead of MailChimp, there is a plugin by the same author named Contact Form 7 Aweber Extension. The setup process is similar to the steps in this tutorial, but in order to get it to work, you have to select Use Custom Fields in the settings. Then you need to map out the CF7 tags to each AWeber Custom Field Name. You should also leave the Required Acceptance Field blank. It is primarily used to confirm a newsletter subscription as a checkbox in your form. This option is not necessary for the sales funnel to work. Need Help Setting up a Sales Funnel? Fill out the form below if you have questions or need assistance setting up a sales funnel in WordPress. Thank you so much!!! I was searching and I cound’t find a solution on how separate full name into first and last name. I almost leave a hacky solution before I found this.